Otumoetai is a Maori word meaning, “the tide standing as if asleep”. 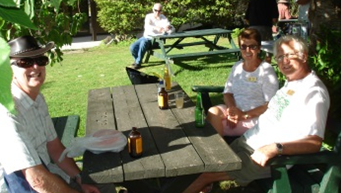 Contrary to the meaning of its name, the Rotary Club of Otumoetai is definitely not standing-as-if-asleep as it meets each week on the shores of the Tauranga harbour. Otumoetai Rotary welcomes men and women with the vision “to grow as a vibrant and professional group of diverse , supportive members who make a positive difference by supporting the community”. The club was chartered in 1968. Its current club membership includes three past district governors. 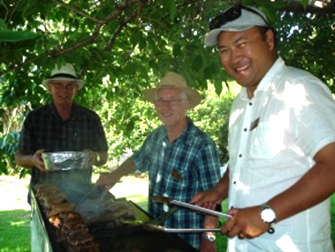 The club has a strong bond of fellowship, starting each year with a BBQ, followed during the year with social occasions in members’ homes, with the added mystery of ‘guess who is coming to dinner’. In 2014 the president laid down the challenge to bring home the cup in the Rotary Yachting Regatta. With a fast boat and a determined crew the challenge was achieved. Youth service is a focus of the club, with strong relationships with Otumoetai College and Merivale School. Each year the club is successful in placing secondary students at the Summer Science Schools in Hamilton and Auckland. 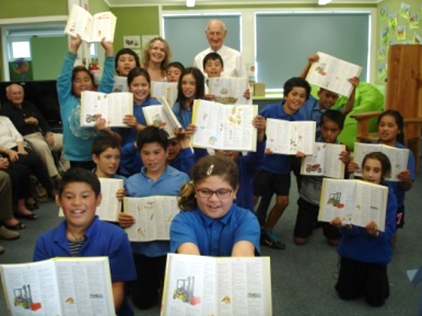 Members and friends visit Merivale School each week to listen to primary children read, all Year 5 children at Merivale receive an illustrated dictionary to assist their learning. 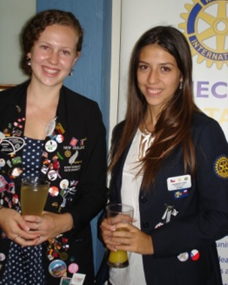 Currently the club is hosting an exchange student from Chile, and has selected a Tauranga student recently who will go to Europe in the coming year. The club has a strong focus on supporting the community. In the Te Puna Quarry Park you will find a Rotary Garden, and a Sensory Garden, which was developed to enable the blind to touch and feel the plants. with a sign in braille outlining the purpose of the garden. 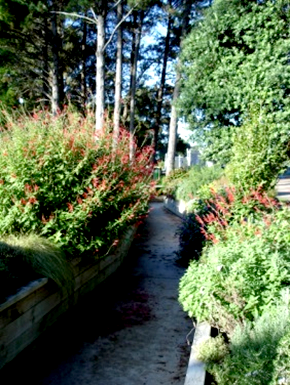 The path through the garden is concreted and gives access to all persons with a disability, and with signage in braille outlining the purpose of the garden. The club is represented on the board of the Kopurererua Trust and assists in the planting of trees along Route “K”, the northern entrance to the city from the Kaimais. To date 20 hectares and $1million worth of trees has been planted in the area, which will develop into amazing wooded walkways and cycleways, and will be an asset to the city. For the past thirty-five years the Antique Fair has been an annual fund raiser for the club, with the proceeds being distributed to community organisations. That fair has come to an end in 2015, with new exciting fundraisers being planned. 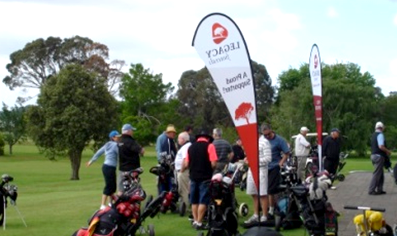 The annual Golf Tournament is entering its seventh year, being a fun day shared by members, friends, players and non-players, and sponsoring companies. Child Cancer is the principal beneficiary of the tournament. Each week members support the Cambodia Charitable Trust, which was established to assist the Cambodian people from the trap of extreme poverty. Through its shop in the Bethlehem Town Centre, the trust works to strengthen communities, and to provide health and education for the Cambodian children. Currently the club is working to encourage other clubs to partner with us in raising funds to build a new toilet block at the Vuna District Primary School on Taveuni Island in the Fiji group. If you want to join a club which making a difference for the local and International community, and having FUN and FELLOWSHIP doing it, give us a call.